This post is sponsored by Better Homes & Gardens at Walmart. Affiliate links have been added for your convenience. All the opinions and love of the products are mine. Before she moved in, I told her that she only needed to bring three things, her sofa, bed and lift chair. 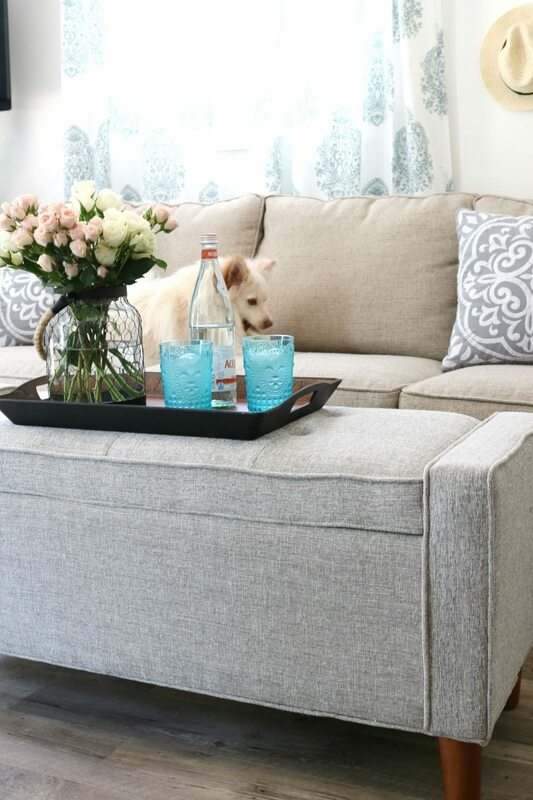 I wanted to have some fun decorating and repurposing items for the space. Of course she brought a few more things and that’s perfectly ok.
Here’s a glimpse of her sweet puppy Rowdy. He’s too busy to sit still for photos! 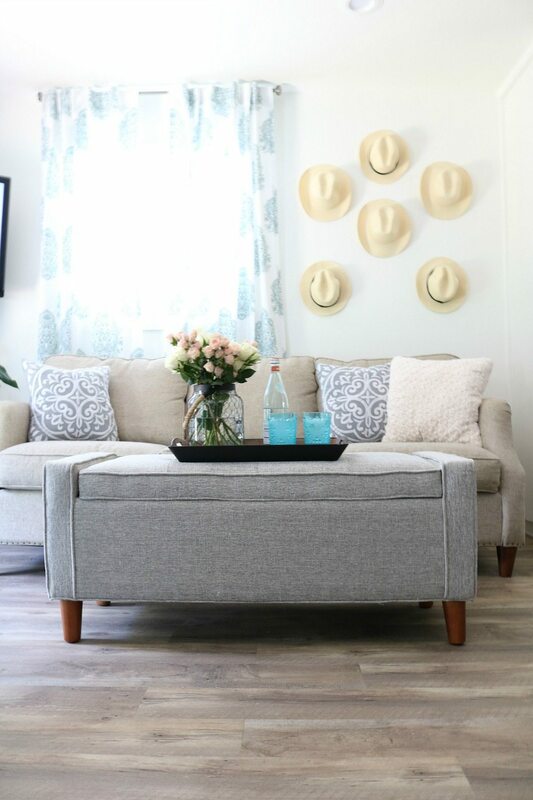 Here’s how I made her small space feel cozy and not cramped. 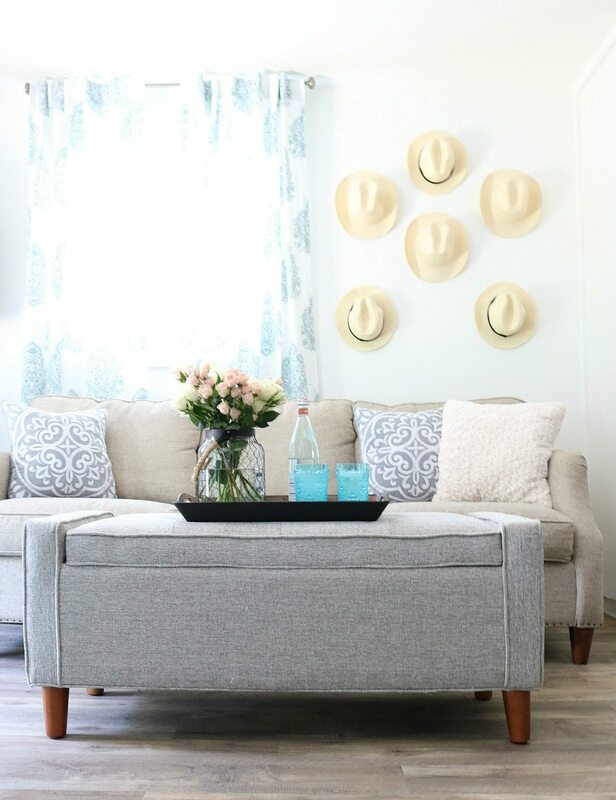 Think double-duty when downsizing, you want cozy not cluttered. 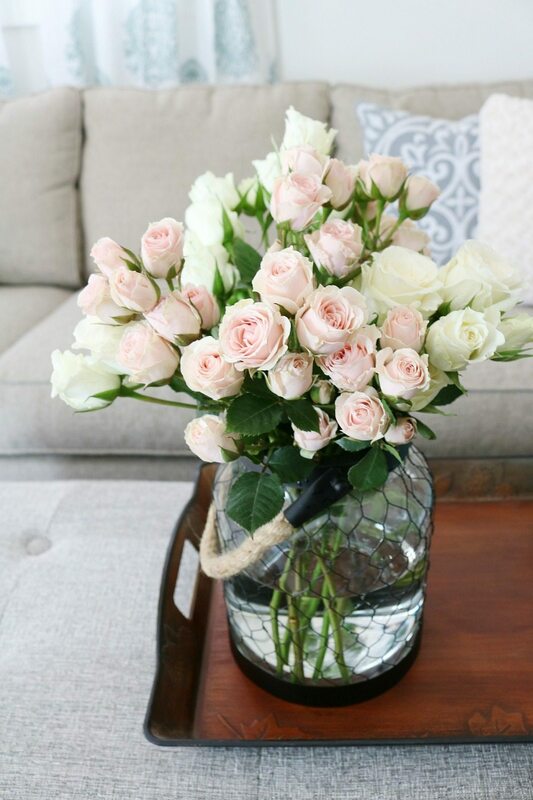 Fresh flowers look great in this farmhouse style candle holder. 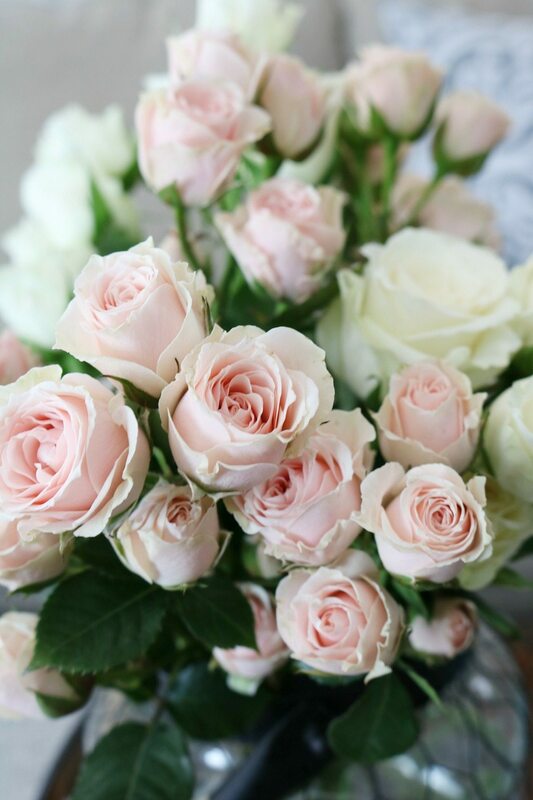 When the flowers fade, just add a candle. 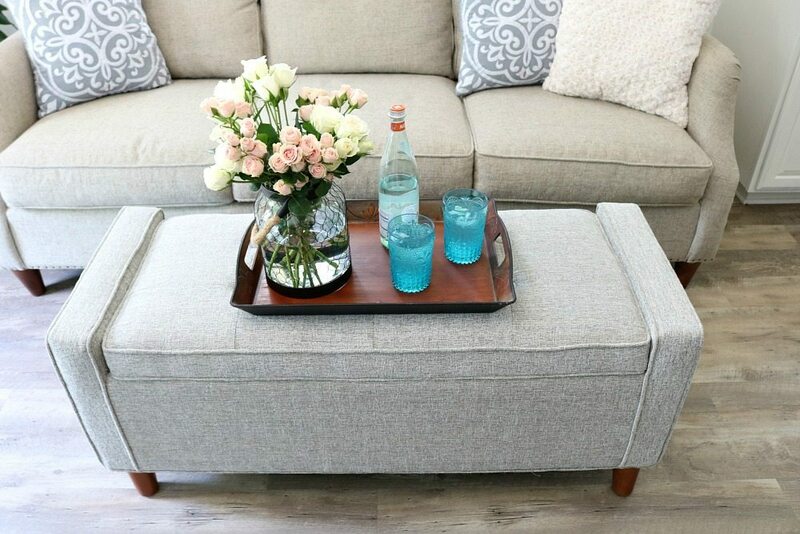 A tray on the bench adds a solid surface for placing your decor or drinks and it make it easy to remove everything when you need to open the bench. 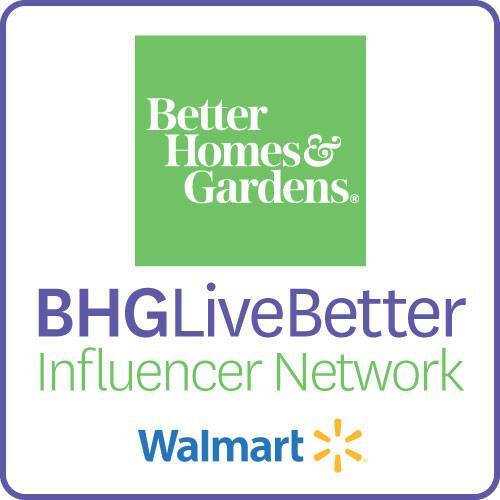 all Better Homes & Gardens at Walmart. 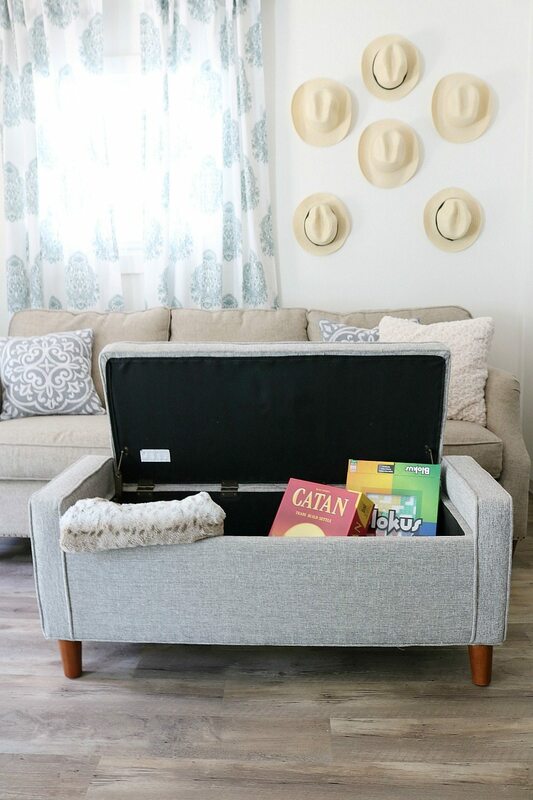 The storage bench holds games and extra throws. 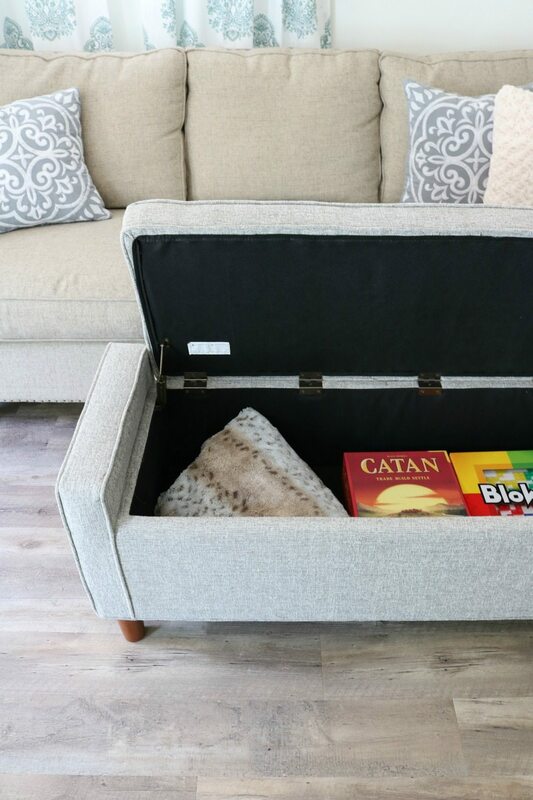 It’s also a great place to store bedding for those times when someone spends the night and sleeps on the sofa. 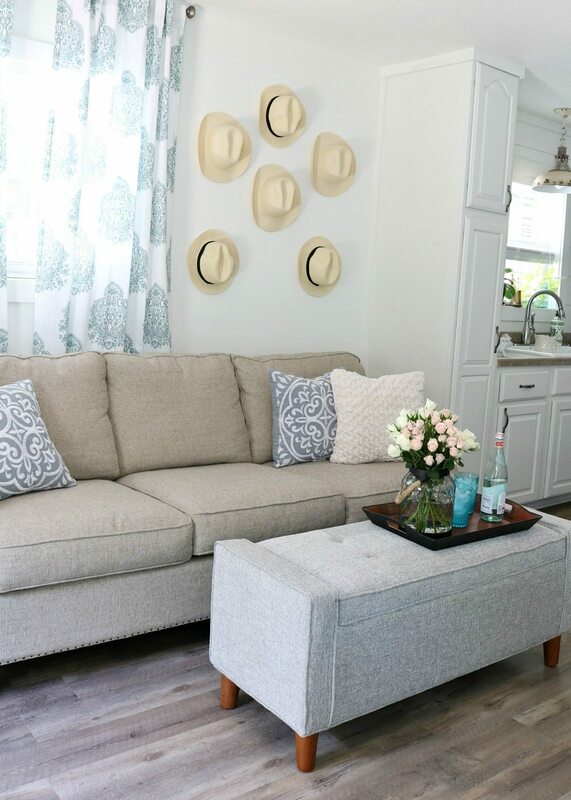 To freshen up the look of her sofa, we added a few pillows. 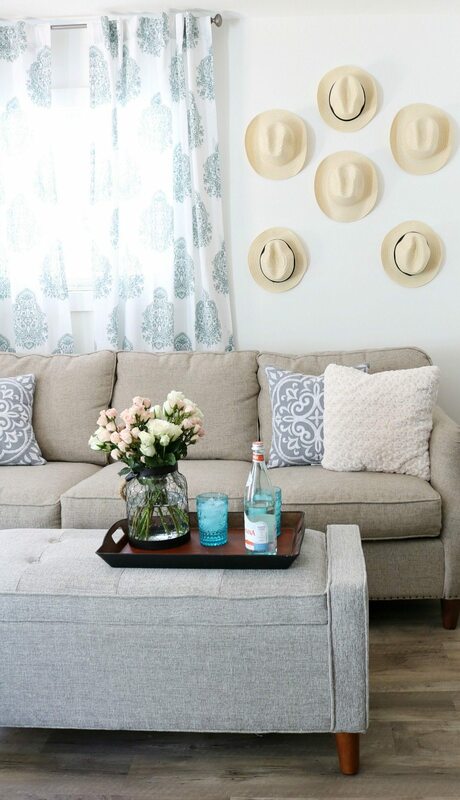 Keeping the tone neutral but adding texture with the rosettes and embroidered pillows. 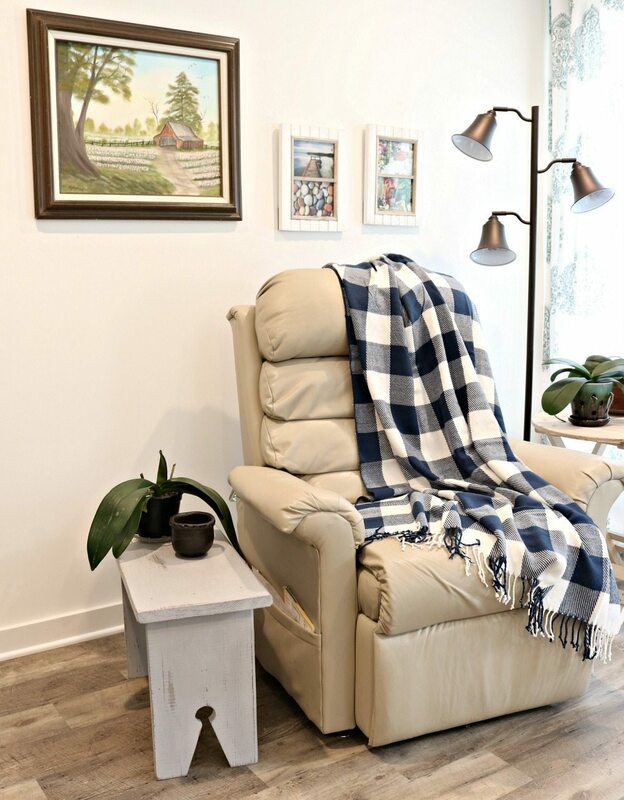 We placed her lift chair on the other side of the room beside it is a small bench that I repurposed a few years ago. Perfect for placing the remote control or whatever she’s reading. She grows beautiful orchids and I’m so sad they’re not blooming right now. You would love them. There’s a small round table near the window and a three light floor lamp, perfect for directing light where she needs it. 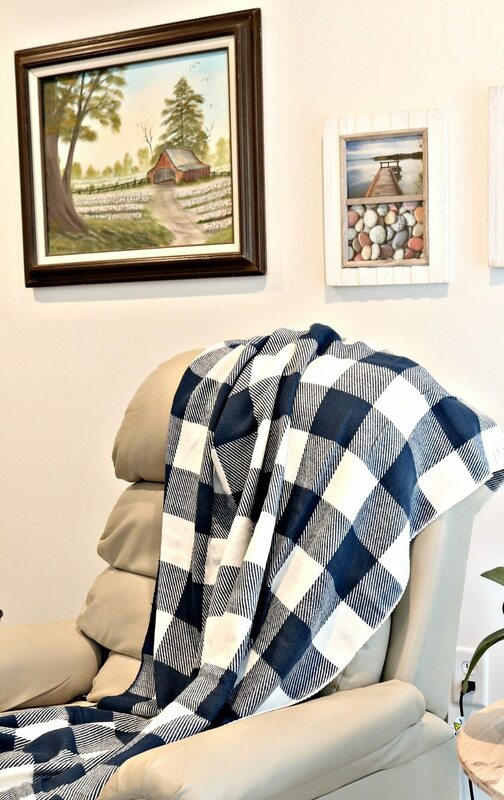 Mama is very talented, she painted the barn oil several years ago and the mountain brook painting, perfect art for the little farmhouse cottage. In fact we still need to hang several of her pieces of art. 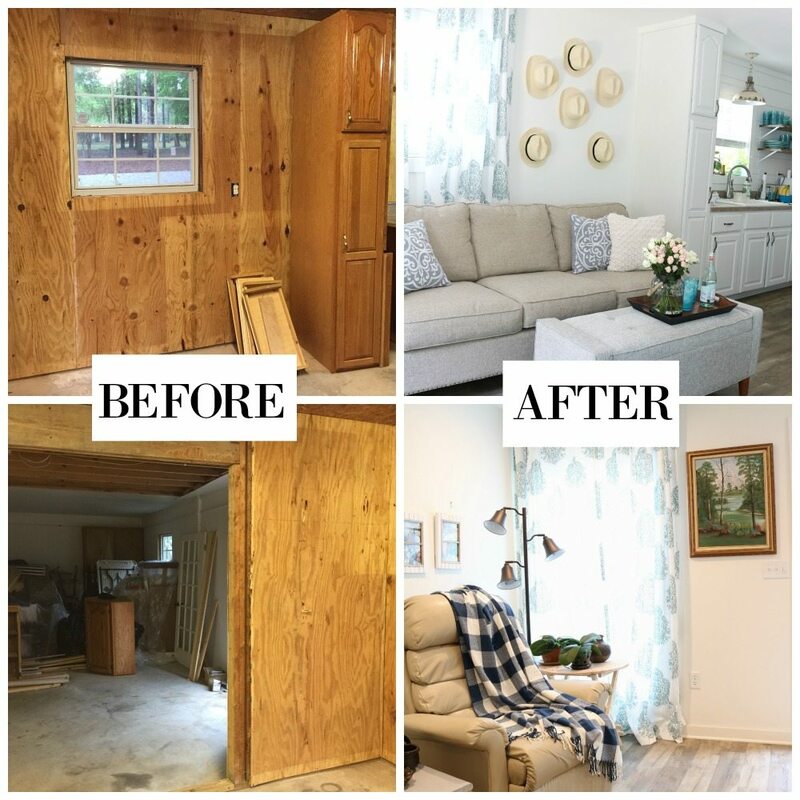 The barn wood look of the double photo frames look great on the wall beside the painting. There's always a throw near by. She had open heart surgery last year and she's on a blood thinner, she stays cold even when it's hot outside. Thanks so much for stopping by! She is loving her new home, it's small but mighty! 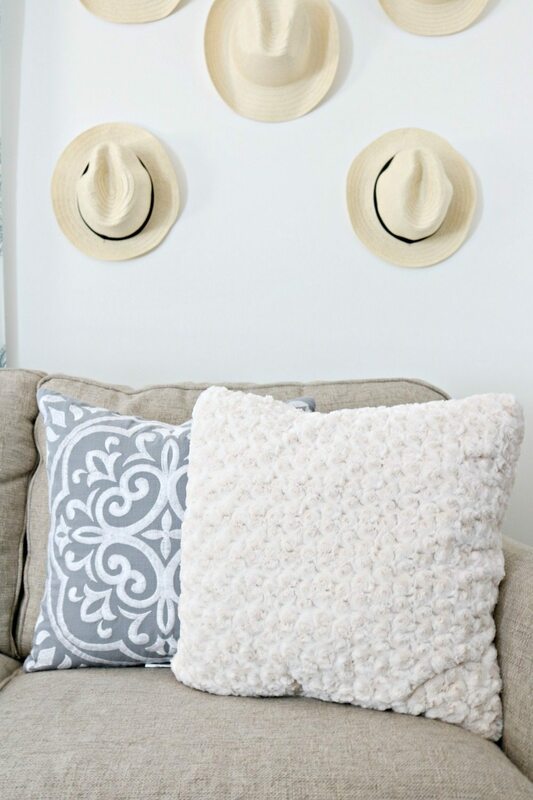 I love finding affordable decor at Walmart and sharing it with my readers, I am proud to be a part of the Better Homes & Gardens Live Better Blogger Network! What an amazing and beautiful transformation. 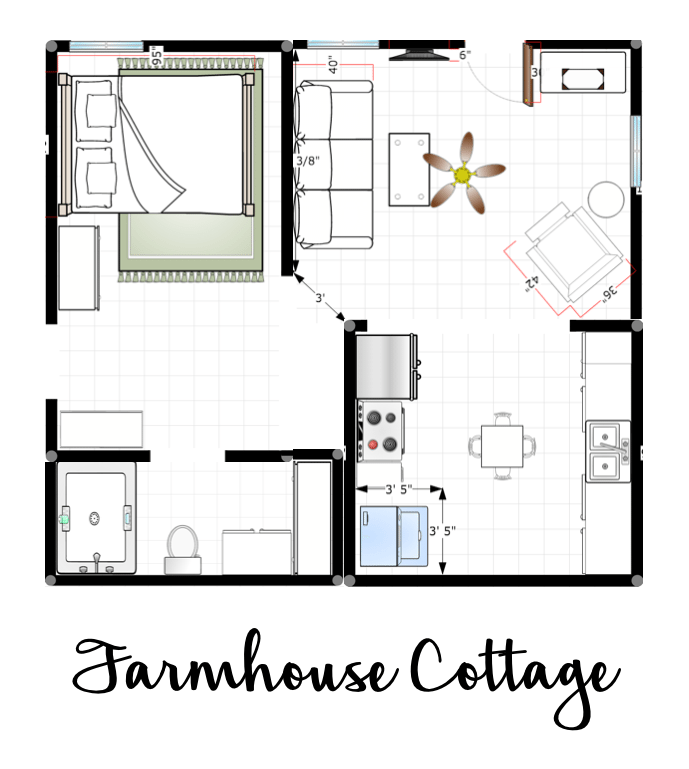 Four years ago i sold my 3 bd/3b home and downsized to my own farmhouse cottage which is a 570 foot old farmhouse in the Appalachian mountains. I love it and it fits me perfectly. 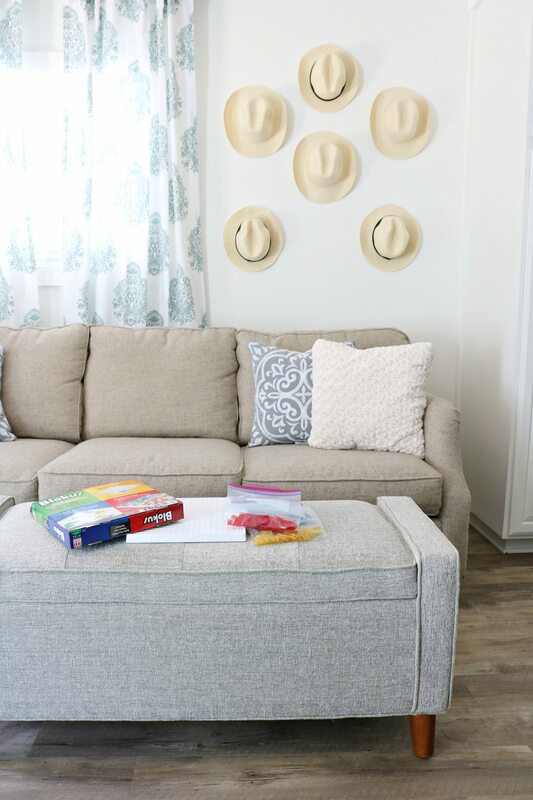 IT is always fun to see how others use their small spaces. How fabulous! Love it all! What a lovely makeover for your Mom. I hope I grow up to be just like her (almost 66 now); I’ve already warned my daughter! I wanted my Mom (iwth dementia) to move in with us (and probably would have needed a placement eventually, but fortunately God had other plans; she stroked out at 93 while trimming the forsythia bush in her front yard! I’ll need more space for my hobbies, though! I could live in your garage! Love it! I don’t know who’s luckier to have whom, you or your mama! 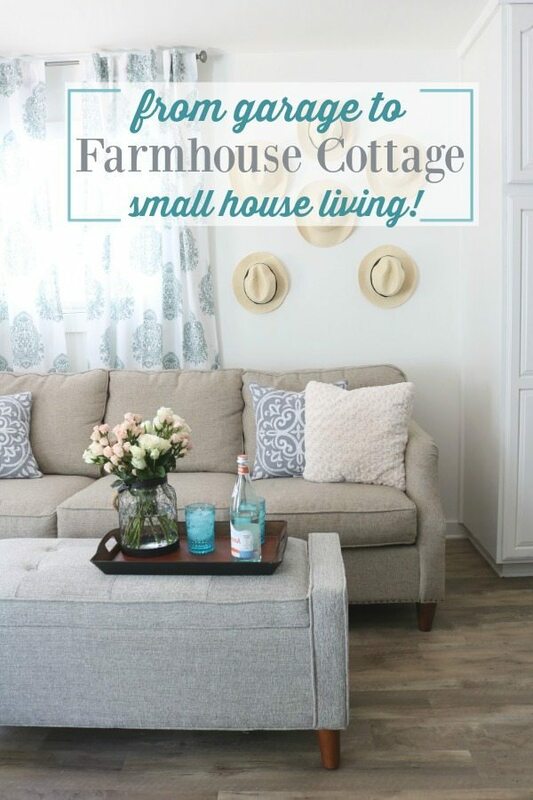 🙂 I love the farmhouse cottage living room. You’ve done such a great job making it a home for your sweet lady. Love the painting she did! Love it! Great job! Can’t wait to see the bedroom/bathroom. Debbie, need to know where you got the curtains for the windows. We are redoing the house — wish you were here!